As you may have seen from the “Renovations highlights” on my Instagram profile, I’m currently working on the re-decoration of our home in France. After ten years of having a beautiful feature wall in dark grey, I’m now planning on having a softer colour scheme to create a more relaxing, soothing atmosphere in sync with the beautiful beaches available around the Bay of Arcachon. To tell you the truth, the bedroom has never been a space of heaven for me in the past like it is for some people. It was mostly a place to sleep and I much preferred hanging out in the open-plan lounge or kitchen. Resting or remaining still was something I had always real trouble with until I sold my business in 2016 and then, I did a complete U-turn on my lifestyle. Now, my health and well-being are a major priority and that means, meditating daily, exercising regularly and having a healthy diet. It also means having a bedroom that feels inviting and eye-pleasing and which naturally contributes positively to this state of slowing down and doing things mindfully. 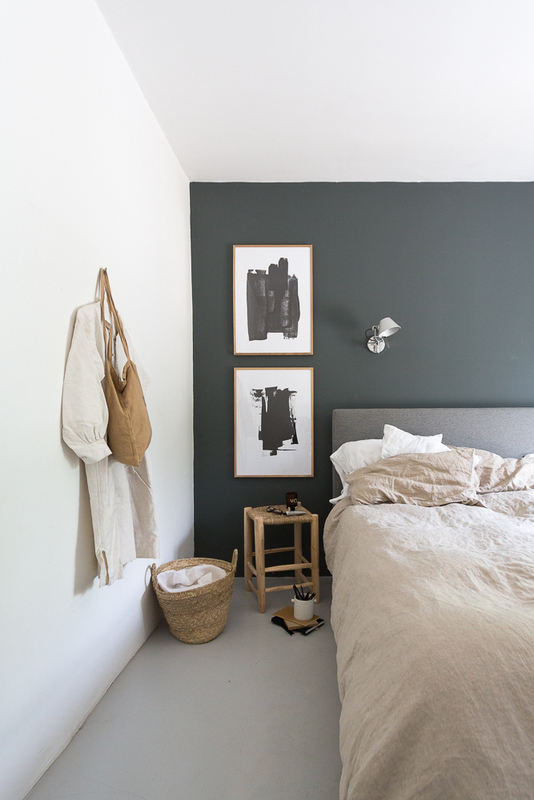 I will be testing a few colour samples on the wall this week but I have already started to make a few styling changes to introduce natural accents and textures to our room. The first thing I did was changing my usual white picture frames for oak picture frames. Desenio has a fantastic range of prints and picture frames in large size and I went for these two beautiful art prints: Ink texture print (top one) and Black Ink print (bottom one), both in 50 x 70 cm. It is the first time I hang large picture frames above each other but I wanted to create a feature corner on my side of the bed to keep the rest of the room simple and I think this works quite well don’t you think? The oak picture frames from Desenio echo beautifully the wood of the Moroccan stool I’m using as a bedside table and the natural stonewashed bed linen. In addition, the simplicity of these two black art prints create a visual focus point in the room while adding a chic, minimalist accent to the wall. To complete the look and add a beachy feel to the room, I also got this great “Catch the waves” poster which I will hang at a later stage once I have painted the walls and decided where our wardrobe will go. Against the wall below, we used to have a large floor mirror which you can see a bit here. As we got our Super King Eve Mattress back from our London home and it takes a bit more space than our previous mattress, I decided to make some room and sold the mirror to my friend for her Airbnb. Hers is also located in the Bay of Arcachon too and if you’re looking for a place to stay, you should check it out, it’s lovely. It was a bit strange at first to walk into the room and not being able to check out my outfit after having this mirror for over ten years in the room. Now, I’m very much enjoying having this plain wall back to experience with styling and I will eventually fit a mirror inside our new wardrobe. To complement the natural look and add textures, I hung the beautiful vintage dress I sourced a couple of weeks ago and an old Bobo Choses bag I was given at a trade show years ago. I hope you like the work-in-progress look of our bedroom. I will reveal the final makeover in a few weeks but in the meantime, I have some great news for you! I have partnered with Desenio to offer you 25% OFF posters between 8th & 10th of May (not valid on handpicked/collaboration posters and frames) with the promo code ‘bodieandfou’. So head to DESENIO now and feel free to follow them at @desenion for more inspiration. Is there a code for the Desenio discount?